Like Pulpit, Malibu Moon, Tapit, Congrats and Mineshaft; son of pre-eminent American sire A.P. Indy from a Mr Prospector-line mare. Brother to another millionaire, Geri and two other Stakes winners, Clure and Almonsoon. From a ¾ sister to South American sire legend, Hussonet. Multiple Graded Stakes winner of US$1,479 million (more than R15million). Five Grade One performances including three quality efforts against World Champions Curlin and Invasor. "A.P. ": SHORT FOR "ANOTHER (STAKES) PERFORMER"
Sire of four Black Type performers in the 2014 racing season, including 14% Black type fillies to runners (Sire's Hand Book). His best and biggest crops are Juveniles and yearlings of 2014/2015. Ready for "take-off." In the USA and UAE, 5 wins, 1600-2000m 14 places, from 3 to 6. Earned US$1,479,000. Timeform equivalent 125lbs. In a land where millionaires are revered for what they are, A.P. ARROW earned $1,5million in a racing career noted for its class, its courage and its durability. A tall, athletic horse, his lustre is enhanced by his superb bloodlines, coming as he does from the daughter of the greatest broodmare in American history, MR. PROSPECTOR, and being a half brother to another millionaire. We expect A.P. ARROW to bring class and an ability to accelerate when the chips are down, and his own brand of athleticism to the mating table. ARCH RIVAL (10c, National Emblem, Coastal). 6 wins from 2400m to 3200m, R774,725, Turffontein Gold Bowl, Gr.2, Book a Table S., Season's Greetings S., 2d Turffontein Caradoc Gold Cup, Gr.3, Clairwood Zultrans H., Greyville Harry the Horse H., 3d Turffontein Java H., L.
Coby (10f, Rambo Dancer, Royal Prerogative). 7 wins from 1800m to 2850m to 2016-17, R743,475, Turffontein Pinnacle S., Champions Day in May S., Charity Mile Entrance Tickets at Computicket S., Trinity's S., A Square Forklift (Pty) Ltd H., Vaal Racing Association H., 3d South African Oaks, Gr.1, Turffontein Gold Bowl, Gr.3, Pinnacle S., Accumalo S., Racing. It's a Rush S., Icredit H., 4th Turffontein Racing Association H., Gr.3. King of Chaos (12c, Fort Wood, Stage Colony). 2 wins at 2, R452,300, 2d Fairview Friendly City S., 3d Fairview East Cape Derby, Gr.3, Champion Juvenile Cup, Gr.3, Turffontein Ready to Run Cup. Kings Archer (11c, Fasliyev, Riverman). 6 wins from 1200m to 1600m to 2017-18, R762,275, Turffontein Tabonline.co.za H., Studio 88 Invitational H., Next Race Meeting is Saturday H., Vaal Book a Table H., Www.Itsarush.co.za H., 2d Greyville Itsarush.co.za H., Scottsville Soccer 6 H., Turffontein Citizen P., Citizen H., Racing It's a Rush Thanks You for Coming H., Supabets H., Vaal Racing It's a Rush H.-twice, Rugby 5 Novice P., 3d Turffontein Wolf Power H., L, Welcome to Turffontein H., Greyville All to Come P., Spar Group H., Turffontein Tellytrack.com S., Tab H., Next Turffontein Meeting is Tuesday H., Vaal Free Kids Entertainment 02 April Graduation P., Racing It's a Rush H.-twice, Www.Itsarush.co.za H., 4th Greyville Byerley Turk P., Gr.3. Walking on Air (10f, Braashee, Northfields). 6 wins from 1400m to 1600m, R456,500, Turffontein Book a Table H., Vaal Racing It's a Rush H.-twice, Bourbon, Beer & Burgers Festival H., 2d Turffontein Itsarush.co.za S., Book a Table H., August Stakes Raceday H., 3d Vaal Supreme Fillies S., L, Rugby 5 H., Rugby H., Jo'burg Prawn Festival 28 February H.
Arrowfield (10f, Orpen, El Gran Senor). 3 wins from 1600m to 1800m, 3d Zimbabwe Oaks, L.
Supa Dupa (10f, Dominion Royale, Al Mufti). 3 wins at 1600m, 2d Zimbabwe Derby, L.
Free Flight (10f, Muhtafal, Free Will). Winner at 1000m, 3d Fairview East Cape Fillies Nursery, L.
Lebeoana (10c, Al Mufti, Russian Fox). 10 wins from 1600m to 2200m to 2016-17, R570,550, Griqualand Flamingo Park H., Northern Cape Stayers H., Racing Association Diamond Stayers, Greyville Soccer 4 H., 3d Greyville Track & Ball Gaming Apprentice H.
Top Shot (11c, Jallad, Foveros). 6 wins from 1600m to 2000m to 2016-17, R619,469, Turffontein Racing Association S., Tellytrack.com H., Live Music Entertainment in October H., 2d Turffontein Citizen H., Tellytrack H., Grand Heritage in September H., Book a Table H., Vaal Tab H., Itsarush.co.za P., Racing It's a Rush H., 3d Turffontein Racing It's a Rush H., 4th Turffontein Drum Star H., L.
Jiffy (13g, Muhtafal, Foveros). 5 wins-3 at 2-from 1000m to 1600m to 2016-17, R338,750, Turffontein Joan St Ledger Lindbergh & Victor Cowles S., Epol Equine Premium Feed H., All to Come Juvenile P., Vaal All to Come Juvenile P.
A P's Lily (12f, National Assembly, Red Ryder). 5 wins-1 at 2-from 1200m to 2600m to 2017-18, R348,625, Turffontein Bondiblu Middle S., 3d Turffontein Pharmaco P., Telemedia H.
Monarch Air (12f, Russian Revival, Northern Guest). 4 wins from 1400m to 1600m to 2017-18, R378,550, Turffontein Sun International H., 3d Turffontein Classic Day Tickets at Webticket H., Vaal Luxury Bus Ride to Turffontein in April P.
Thirtytwo Squadron (11c, Jallad, Northfields). 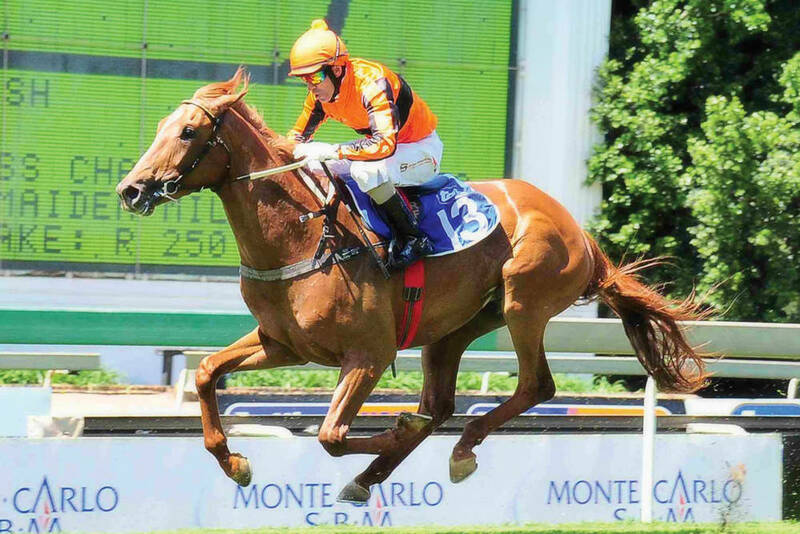 4 wins at 1600m, 1900m to 2016-17, R318,050, Greyville Itsarush.co.za H., Volt Energy International H., 2d Greyville Summerhill Stud Kwazulu-Natal Breeders H., 3d Greyville Itsarush.co.za H.-twice. Flying Dream (12f, Jallad, Green Dancer). 3 wins from 1600m to 2400m to 2017-18, R289,550, Vaal Book for Classic Day in April H., 3d Turffontein Citizen H.
Cristal Arrow (10f, Fahal, Ahmad). 3 wins from 1450m to 2000m, R245,050, Vaal Bourbon, Beer & Burgers Festival H., 2d Vaal Bourbon, Beer & Burgers Festival H., 3d Vaal Racing It's a Rush H.
Glider Pilot (13c, Fard, Braashee). 2 wins at 2000m to 2017-18, R299,425, Vaal Book for Champions Day in May H., 2d Turffontein 30 Year Anniversary Hennenman Memorial Progress P., Book for Guineas in March Progress P., 3d Vaal Itsarush.co.za H., 4th Greyville Daily News 2000 S., Gr.1. Feels Like Heaven (11f, Street Cry, Scenic). 2 wins at 1600m, 1950m, Scottsville Katsumi Yoshida H.
Flight Warning (10g, Requiem, Coastal). 2 wins at 1600m, 2450m, R248,875, Turffontein Soccer GG H., 2d Turffontein Triple Crown Coming Soon H., 3d Vaal Book a Table at Our Next Raceday H., 4th Turffontein Derby Trial, L.
True Arrogance (10g, Steady Beat, Kaljerry). 2 wins at 1600m, Turffontein Computaform Express H., 2d Scottsville Flowe-Pac H., Turffontein Thank You for Racing With Us Today H.
Subtle Force (13f, Mogok, Centaine). 4 wins at 2000m, 2400m to 2017-18, R306,950, 2d Vaal Supabets H., 3d Vaal Classic Day Tickets at Webticket P.
Portman Square (12c, Kahal, Kahir Almaydan). 4 wins from 1800m to 2200m to 2017-18, R262,125, 3d Griqualand Northern Cape Stayers H.
Big Shot (11g, Kahal, Coastal). 3 wins at 1600m, R322,000, 2d Vaal Book a Table S., Racing. It's a Rush H.
Night Fall (11f, Exclusive Patriot, Lydian). 2 wins at 1700m, 1900m, R224,175, 2d Turffontein Thank You for Joining Us Today H., 3d Turffontein Soccer GG H.
Shamal (10f, Fahal, Sir Ivor). 2 wins at 1450m, 1600m, R250,275, 2d Turffontein Racing Association H., Vaal Thank You for Joining Us Today H., Bourbon, Beer & Burgers Festival H., Racing Association H., 3d Vaal Soccer GG H.
Charter Jet (13f, Way West, Braashee). Winner at 1400m in 2016-17, R265,400, 2d Turffontein Joburg Prawn Fest in April H.
Dahlia's Arrow (11f, Northern Guest, Dahar). Winner at 2600m, 3d Turffontein Racing Association P.
Hit the Big Time (11f, Way West, Braashee). Winner at 1800m, 3d Vaal Www.Itsarush.co.za Graduation P.
Run the Arrow (10f, Rambo Dancer, Lustra). Winner at 1800m, 3d Vaal Computaform Express H.
A.P. Chanel (11f, National Emblem, Coastal). 6 wins from 1700m to 2000m to 2017-18, R387,400.